Home › Northern shoveler › Marbled teal - Marmaronetta angustirostris. The marbled teal (Marmaronetta angustirostris) is a medium sized diving duck belonging to the family Anatidae. The marbled teal species is distributed in Mediterranean region, Asia, Africa and Indian Subcontinent. Marmaronetta angustirostris was previously included in the genus Anas. The marbled teal species is considered as a link between dabbling ducks (Anatinae) and pochards (Aythyinae). The marbled teal is a small bird, measuring 40 to 50 cm in length. The male teal is larger than the female and weighs 350 to 600 grams. The female teal weighs 330 to 530 grams. The wingspan is 60 to 70 cm. Their plumage is grey-brown and they lack speculum. The brownish body is flecked with cream-brown pattern. The neck and wings are long. They have a dark eye patch. A broad eye stripe is present from eye to nape. The bill is black. They have a small crest. These teal species inhabit water bodies with abundant emergent and submergent vegetation such as ponds, streams, marshes, swamps, coastal wetlands and flooded grasslands. The marbled teal species are omnivorous and feed on aquatic plants, seeds, shoots, roots, tubers, aquatic invertebrates, molluscs and crustaceans. The breeding season is from mid April to late June. The marbled teal species nest on the ground, near the water edge under vegetative cover. The nest may contain 7 to 10 cream eggs. The distribution is fragmented. The marbled teal species are distributed in Spain, Morocco, Algeria, Tunisia, Turkey, Israel, Jordan, Syria, Armenia, Azerbaijan, Russia, Iraq and China. These teal species winter in the Indian Subcontinent, Iran, Egypt and West Africa. These teal species are partially migratory. Breeding populations occurring the northern parts move southwards for wintering. These teals disperse widely for feeding grounds after breeding. The global population is estimated to be 50,000 to 55,000 individual birds. The fragmentation of the population, habitat degradation and hunting are the main conservation concerns. 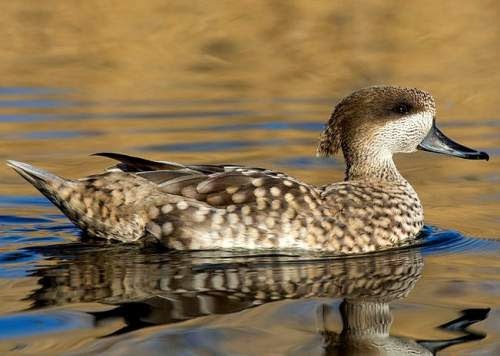 The IUCN (International Union for Conservation of Nature) has categorized and evaluated these teal species and has listed them as "Vulnerable". Current topic in Birds of India: Marbled teal - Marmaronetta angustirostris.